Dr. Larry Chism received his Bachelor of Science in 1975 and went on to receive his Doctor of Optometry shortly after, concentrating in contact lenses and low vision. Since 1980 Dr. Chism has been full owner and managing associate of Vision Source-Tyler, a private practice providing full scope optometric eye care services. Dr. Chism is committed to helping patients gain back their freedom. He has been providing low vision care for 20 years and has extensive experience in working with individuals who have suffered from decreased vision. These individuals desire to gain back control of their lives and not let decreased vision interfere with their happiness. For this reason, Dr. Chism is referred to by his patients as “the see better doctor”. 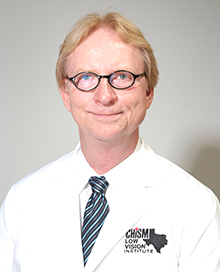 For your convenience, Dr. Chism commutes to six different locations throughout Texas.